Polymer clay is a great imitator and can be used to create anything that the mind can dream. 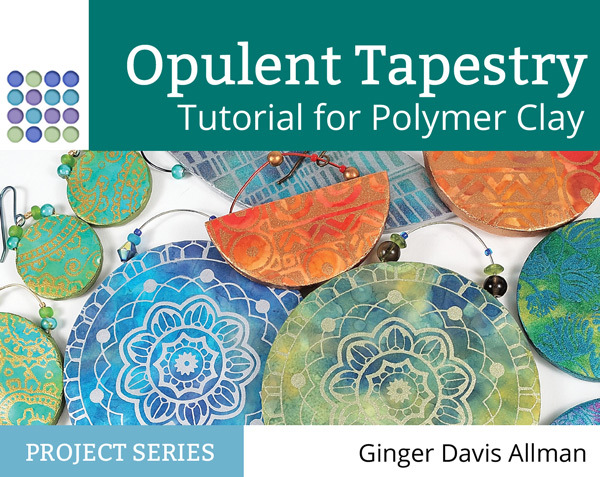 This tutorial shows you a way to create decorated sheet of polymer clay that is reminiscent of opulent tapestries, using both the rich colors and the metallic, sparking accents. You will then learn how to make a pair of earrings featuring your Opulent Tapestry sheet. I'll take you through every step...there's no worry of getting lost. There are clear pictures and text for each of the 42 steps! This is a easy level tutorial that requires little to no previous polymer clay experience. I don’t, however, cover the basics of working with polymer clay, so if you’re new to this material you might want to add my Getting Up to Speed in Polymer Clay informational primer to your order. The Opulent Tapestry Tutorial is 28 pages long and contains 55 photographs. The project illustrates how to make a pair of earrings but I also discuss how the same project can be easily adapted to make pendants, ornaments, tags, or home decor. In addition to the usual polymer clay and crafting supplies, you'll need to have a silkscreen stencil of your chosen design and some alcohol inks. The resources section contains links to many silkscreen vendors and artists around the world. I also give a useful list of polymer clay suppliers around the world.